Leah Ronhaar is a native of Reno, Nevada, and graduated from the University of Nevada, Reno with a Bachelor of Science in Mathematics in 2002. She is a lifelong skier, hiker and camper, and loves the outdoors. Leah joined Bradley, Drendel & Jeanney in 2012 as a California licensed attorney and was admitted to the Nevada Bar the following year. 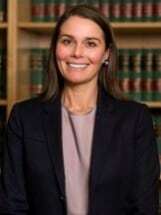 Leah represents clients in motor vehicle collisions, premises liability, nursing home negligence, and insurance bad faith across California and Nevada.